putting you at the heart of the process. Develop a Team. With any given project, we first look within our team to determine which facilitators will collaborate with the client. We make this decision based on our expertise and availability. Define Your Goal. Understanding the point of your project is the backbone against which all our work is structured. Before diving into how we are going to do your project, we will work with you to clearly articulate exactly why you are bringing people together, what input you are looking for, and what kind of decision you will ultimately make with this feedback. Gather Information. With a clear sense of where we’re going, we then work to understand your unique context and history. This might include conversations with decision makers, literature reviews, research into your industry, stakeholder analyses, etc. Design. During this phase, we engage you to collaboratively develop a strategy for your project. Your input and insight is essential to informing how our methods and the project unfolds. This stage, coupled with the goal definition and information gathering stages, make up the planning portion of your project. This is the piece that requires the most time, attention and care as it sets us up for a successful execution. Execution. This phase varies based on the nature of the project. It could be a half-day planning session, a multi-day community engagement process, or a series of focus groups and surveys that contribute to a larger project. Deliverable. It is of utmost importance to us that we help you discuss and act. In the design phase, we will decide on a series of deliverables that will help you take the event and turn it into action. This may be through a report, supplemented by a variety of notes, a visual recording of the event and/or visual summaries. As with the design phase, you will be engaged in the creation of the final products, ensuring you get something that will help your organization or project move forward. We are especially interested in multi-phase projects where we are involved in the design, execution, analysis and context, stakeholder/community engagement and creating the deliverable. How we get you from here, to there. Graphic recording helps groups see connections, solutions and change. Graphic recording helps groups process large amounts of new information in a visually engaging way. Graphic recording helps us organize events, engage participants and create summaries and histories. Graphic recording allows us to accommodate to various learning preferences. Co-facilitation brings multiple perspectives and insights to your event. Co-facilitation draws together different tools from the members of our team. Co-facilitation lets us be more responsive to your needs, allowing one person to guide the event while the other monitors the group’s well being and progress. Co-facilitation brings more energy to the day. About: Co+Host worked with the Queen Charlotte Heritage Housing Society to conduct a thorough needs assessment on the local housing market. This project fused the lived perspectives of renters, landlords, home-owners and service providers with current data, to develop a picture of local strengths, needs, and opportunities. Methods: We took a mixed-method approach to gathering information about the local housing market, which involved a community-wide survey, key informant interviews, focus groups and a literature review. Data gathered was synthesized, analyzed and summarized in a final report accompanied by a visual executive summary. Results: Co+Host compiled a Needs Assessment as per the requirements of BC Housing that documented needs in the local housing market. The results were shared at a Co+Host-facilitated islands-wide community housing forum, and it was used to access funding to meet the identified needs. The Queen Charlotte Heritage Housing Society has since embarked on two large-scale housing projects to address critical needs. 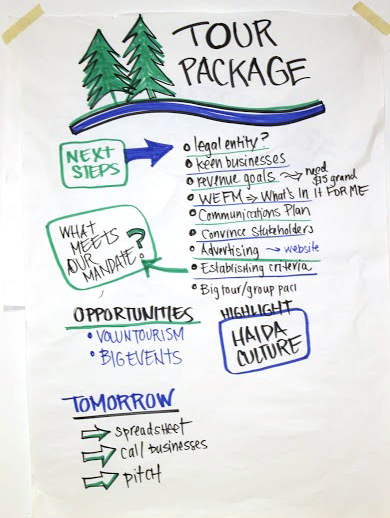 About: Co+Host worked with local non-profit Haida Gwaii Community Futures to develop a new 3-year organizational strategic plan. Methods: Prior to the strategic planning session, Co+Host designed, delivered and reviewed a series of surveys and interviews designed to assess the values and priorities of staff, board members and clients. Pre-session findings were synthesized into visual summaries and into a draft strategic plan, that served as the foundation for the day-long planning session. Results: Following the planning session, Co+Host compiled all data into a succinct, actionable strategic plan that will guide the organization over the next 3 years. Co+Host also provided strategies for reviewing progress against the plan as time progresses. About: On November 19, 2016 the Gwaii Trust Wellness Committee held a full-day forum facilitated by Co+Host to discuss gaps in the wellness sector on Haida Gwaii. Approximately 40 professionals were in attendance, and they represented a broad cross-section of the sector (doctors, administrators, health centres, counsellors, nurses, etc.). Many participants remarked throughout the day that the diversity of attendants made this event unprecedented on Haida Gwaii. The opportunity to connect with each other, across disciplines, was a special aspect of the event. Methods: The day began with stories from four different professionals about successes they have experienced within the wellness system on Haida Gwaii. Participants then engaged in a series of discussions - first in pairs and then in small groups - about specific gaps/challenges they were noticing in their work. At the end of the morning, the small groups began to combine those gaps/challenges into the top 10 themes later identified in this report. In the afternoon, each participant selected 2 of the 10 themes to discuss in greater depth. By breaking off into smaller multi- disciplinary groups, participants explored the root causes of the themes, and potential solutions. Result: Following the event, Co+Host compiled a report that outlined a series of first steps that the Gwaii Trust Wellness Committee (GTWC) could take that could improve wellness on Haida Gwaii. Co+Host facilitated a follow up forum in the spring of 2017 to continue advancing the decision making process. About: NSCU held a series of focus groups across Northern BC to gain insight into personal and business member customer service experiences, preferences and pain points to better service their customers. Co+Host was hired to design and facilitate the Haida Gwaii focus groups, which were held in Queen Charlotte and Masset in April 2017. Results: Information collected was summarized with key findings, participant quotes and recommendations in a comprehensive deliverable. The information was utilized by the NSCU for strategic planning purposes. About: Swan Bay Rediscovery Camp, Mount Moresby Adventure Camp and Haida Gwaii Rediscovery Camp asked Co+Host to assist facilitate a collaborative planning day with their staff and volunteers. The objective was to review, identify and explore new opportunities for the 3 organizations to collaborate. Methods: We worked with representatives from the camps to design two half-day strategic planning sessions for board members and staff from each camp. The first day involved a group discussion around the value of collaboration and the opportunities that exist. The second session refined the long term plan and then we worked with the group to design an effective funding proposal that incorporated graphics and told their story. Result: The basis of a 5-year strategic plan was developed and support was provided to assist the camps with creating a brochure to be used as their funding proposal. About: Co+Host worked with Bird Studies Canada to engage local stakeholders to develop and build ownership over biosecurity plans for areas of Haida Gwaii. Methods: After conducting a thorough stakeholder analysis that revealed the needs and opportunities with each major stakeholder group, we tailored our approach and techniques to each sub-group. The first group participated in an action planning workshop, designed to generate commitment to a draft plan. The second group participated in a strategic planning process, that generated commitment to future actions. The third group, comprised of the general public, participated in an interactive and educational day, designed to build local understanding and interest in bird-focused biosecurity work on Haida Gwaii. Results: The first group made noteworthy commitments towards new biosecurity initiatives in their area. The second group brought together stakeholders that had yet to properly connect, and together they developed ideas about how to move forward together. The final group provided excellent feedback about what they learned about birds, biosecurity, and protecting the natural world on Haida Gwaii. About: Co+Host worked with the Marine Plan Partnership for the North Pacific Coast (Council of the Haida Nation & Province of British Columbia) and the Gwaii Trust Society, to collect data on the local workforce. Specifically, methods sought to gather data that could inform labour force imbalances and human resources planning activities that could address concurrent challenges with high rates of unemployment and a lack of qualified applicants to fill vacancies. Methods: After developing a comprehensive map of stakeholders, we gathered the relevant data through a series of surveys and structured interviews that were specifically designed for individuals, minor employers and major employers. Results: The data collected was summarized and provided to the organizations, in order to inform a subsequent analysis. About: Co+Host worked with Laskeek Bay Conservation Society (LBCS) on a two-day stakeholder engagement and operational planning session, bringing together diverse voices to inform the next three years of the Society’s work. Methods: We began with a planning session with LBCS staff to gain insight into the needs of the organization. The first day day of the session brought together multiple community groups and individuals to delve deeply into the past, current and future work of LBCS, in the context of environmental monitoring and conservation in Haida Gwaii. These rich conversations were directly reflected in the operational work of the second day, where we led the LBCS board and staff through the development of a three-year operational plan. Result: With the work done over the two-day session, Co+Host compiled and finalized the LBCS Operational Plan. In an iterative process with the board and staff, we arrived at a finished plan that will be a living document frequently used by LBCS to direct their coming years. About: The Village of Port Clements commissioned this feasibility study to explore potential synergies between the school bus services, existing transportation service providers and public transportation needs on Haida Gwaii. Methods: Co+Host began with a literature review and environmental scan to contextualize this study within provincial, national and global systems. We then conducted a series of stakeholder interviews, in order to build an understanding of the local transportation landscape. These interviews were followed by a public survey designed to capture public transportation needs. Co+Host summarized and analyzed these findings, in order to present a series of recommendations for future action. Result: Co+Host presented a comprehensive analysis of current and desired transportation systems on Haida Gwaii, along with five potential service solutions and four new public transportation options. We offered two recommendations and an action plan, designed to improve the school bus service and broader public transportation on Haida Gwaii. The final report included a visual summary, and a map depicting current public transportation options on Haida Gwaii. About: In the spring of 2017, 12 members of the Success by Six North Coast (SX6) Council of Partners (CoP) met for three hours in Prince Rupert to develop a strategic focus for the upcoming year. As an organization that supports a number of initiatives, the intention behind this session was to identify key focus areas where greater depth could be pursued. Methods: After a brief review of current activities and organizational context, attendants established two key priority areas through individual reflection, small group conversations and a final large group conversation. With two priorities selected, the CoP then divided into two working groups to discuss specific goals, associated activities, and how progress would be measured over the next 12 months. Results: Co+Host distilled the day’s conversations into a simple table outlining the goals, activities and deliverables for two key areas of focus, along with a justification for why those areas of focus were selected. This plan was presented to the CoP for final approval, and will be revisited one year later to measure success and modify priorities for the year ahead.